In the 1980's, Jeff became a member of the legendary Apple band, Badfinger, singing such classics as "No Matter What" and "Day After Day." In 1999, Bob Birch, bassist with Elton John, introduced Jeff to his band mate at the time, John Jorgenson. John, a world renown guitarist also of The Hellecasters and Desert Rose Band fame, asked Jeff to join his original electric group. Notably he has toured with Badfinger, John Jorgensen, Mick Taylor (Rolling Stones), Denny Laine (Wings, Moody Blues), Terry Sylvester (Hollies, Swinging Blue Jeans)and 60's teen idol Johnny Tillotson. Jeff is currently the musical director for the newly reunited Peter & Gordon as well as being a Pacemaker when Gerry Marsden (Gerry & The Pacemakers) tours in the United States. His newest CD, "Lock My Feelings In A Jar" is now available. Jeff Alan Ross is on Facebook! RadioIndy is pleased to announced that we have published our CD Review of Jeff Alan Ross music to Facebook. 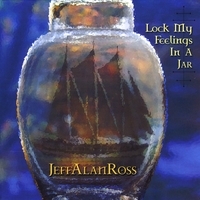 RadioIndy is pleased to present Jeff Alan Ross with a GrIndie Award for the CD "Lock My Feelings In A Jar"
Jeff Alan Ross Press Release on Digg.com! "Lock My Feelings In A Jar" Reviewed by RadioIndy.com!